Taking A Look At Wolf Look Alike Dog Breeds. 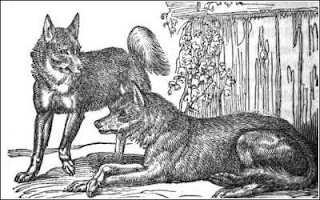 It was after the Saarlooswolfhond and the Czechoslovakian Wolfdog were recognized by official organizations that the first wolf look-alike dog breeds (presumably without wolf content) were started. Meanwhile, in 1991, Ann Dresselhaus began crossbreeding several different dog breeds from many different dog types , with the intent to create a wolf looking dog breed capable of almost any kind of work. 1921 — Leendert Saarloos begins crossbreeding German Shepherd Dogs with wolves. 1955 — Mr. Ing. Karel Hartl begins crossbreeding German Shepherd Dogs with wolves. 1975 — The Dutch Kennel Club recognizes the Saarlooswolfhond as a new breed. 1981 — The FCI recognizes the Saarlooswolfhond as a new breed. 1982 — The Cynologic Organization in Czechoslovakia recognizes the Czechoslovakian Wolfdog as a new breed. Around 1987 — Edwina (Eddie) Harrison begins crossbreeding northern and herding breeds. 1991 — Ann Dresselhaus begins crossbreeding herding, northern, retriever, sheep guarding, and sighthound breeds. 1996-97 — The Northern Inuit emerged from Eddie's foundation dogs. 1999 — The FCI recognizes the Czechoslovakian Wolfdog as a new breed. 2002 — The Utonagan split from the Northern Inuit and today is considered by some to be a separate breed. 2005-06 — The Tamaskan Dog breeding program began, with foundation dogs including Utonagan/Northern Inuits, and Finish Racing Huskies. After 2007 — Right Puppy Kennel begins breeding the Tamaskan Wolfdog, using Tamaskan Dogs, wolf looking northern breeds, and possibly wolfdogs. 2009 — Breeders who resigned from the Tamaskan Dog Register begin breeding the Aatu Tamaskan. 1. "Saarloos Wolfdogs Basic Info". Saarloos Wolfodgs on Facebook. 7 March 2011. 2. "History". Cheope: Czechoslovakian Wolfdog. 7 March 2011. 3. "Breed History". Wild Horizons Northern Inuit Dogs. 7 March 2011. 4. "Alaskan Noble Companion Dog". Buckhorn. 7 March 2011. 5. "Utonagan History". Twatha Utonagan. 7 March 2011. 6. "The History of the Tamaskan Breed". The Tamaskan Dog Register. 7 March 2011. 7. "Does the Tamaskan Dog Contain Wolf?". Tamaskan Dogs discussion on Facebook. 7 March 2011. 8. "Growth of the Aatu Tamaskan in the US". Tamaskan Breeders Association. 7 March 2011. 9. "The Aatu Tamaskan Breed Standard". Tamaskan Breeders Association. 7 March 2011. 10. "Introducing the Aatu Tamaskan". Buckhorn. 7 March 2011. The Tamaskan registry was doctored and it was discovered that the Czech wolf was introduced as foundation stock. The same goes for the Alaskan Noble Companion Dog. These are wolfdogs, plain and simple. I know, because I have one of Ann Dresselhaus' Alaskan Noble Companion Dogs; he has been a challenge, and we've spent tens of thousands of dollars in fencing, both above ground and undergroun, to keep him safe and contained; we love him dearly. I also researched her bloodlines. She has used wolves and wolfdogs for her foundation stock, but she refuses to admit these are wolfdogs. As a result, many of her dogs have had to be re-homed, put into wolf rescues and even one was put down, all because the unsuspecting buyers thought they were getting a dog that looks like a wolf. It's a dangerous and unfortunate road Dresselhus is taking, both for her wolfdogs and for her buyers. The Alaskan Noble Companion Dog is a wolfdog. I've had a utonagan for almost six years now from the Sulin line and I am totally convinced that she has quite a high content of wolf in her although none of the breeders are prepared to admit it. She is a constant challenge and I have considered re homing her on more than one occasion. I also have an Akita who is a big mush but has had to defend himself against her a few times now as she had attacked him, a couple of times when she was in season and once for no reason at all. Fortunately for her the Akita knows the command "drop it! " very well but she just went back for more! She has a strong bond with me and would try and stop me from leaving the house by either biting me or jumping up at me and pushing me. I'm 4ft 9 and 6 and a half stone soaking wet and she has caused me injury more than a few times. Nearly six years on, she has gotten somewhat better but still has seperation anxiety if I leave her even if there's someone else in the house with her. She's overly demanding , stamps her feet like a spoiled two year old to get attention or treats (which I don't entertain I might add ) howls non stop if I'm not there, has a strong prey drive and doesn't like small children which is frightening to say the least. A year ago she bit a friend of ours and I tried at that point to find her a new home through the utonagan society and got no end of verbal abuse and assumptions that the problems we were facing with her were my fault and nothing to do with her having wolf content in her. I am at a loss as to what to do with her short of doggy vallium. I honstly think that if I re homed her she would bite someone else and be put down and I really don't know what else to do. I feel like a prisoner in my own home and her howling and constant winning for attention is driving us mad. Both my fiance and I have had many dogs in the past and have never had any problems training them but this one has had us both questioning are affinity with animals. Can you suggest anything we can do? And do you know for sure whether the Sulin line has got wolf in them? Hello, thank you for this very useful timeline! I just learned of another breed you might be interested in researching. The Kunming Wolfdog. According to Wikipedia it is an established breed of wolfdog that originated in China. This website is a PERSONAL blog. In it, I review information from the internet about these wolf look alike breeds. I also post my own speculations, opinions, and rumors that I think are interesting. This is ONLY an online journal for me to keep tabs on the various breeds out there. Outside readers are welcome to use my website as a source of information and discussion; and while I try to maintain accuracy and post objectively, I cannot guarantee either. So it is hugely important to do your own research and come up with your own conclusions. If you find copyright information posted on my blog that you own, and would either like (1) attribution, or (2) it to be removed, please post a comment on the article in which it was used. I cannot control what guests post on my blog, but I will take down any comment left on my blog that myself or others find offensive or if it contains copyright material. Also, if you find information on my blog incorrect, please leave a (polite) comment in the appropriate article letting me know. Also, please provide some kind of proof to back up your claim. If the evidence is substantiate, I will correct my post as soon as possible citing you and your evidence as my source (unless otherwise requested).